Forty-two new Islamic seminaries came up in Pakistan’s capital last year, a development the government hopes would promote President Pervez Musharraf’s advocacy of “enlightened moderation” in disseminating religious education. Copyright 2006 by Danish Khan (via iStockPhotos). Islamabad, Jan 1 (IANS) — Nineteen more madrassas are under process after the government lifted an earlier ban in end-2005, realising that it was “easier to fight terrorism, but not religious extremism”, Dawn reported. Quoting a report of the Islamabad Capital Territory (ICT) administration, the report said 127 madrassas were being run in the capital. Of these, 77 were registered, 42 only in 2006, 31 unregistered and 69 ‘unauthorised’. Media reports have earlier said the seminaries resist government control — and in some cases involving the better off institutions even government funds — when asked to register and give details of the curricula being taught to the students. The government has met with only partial success even in keeping foreign students out. 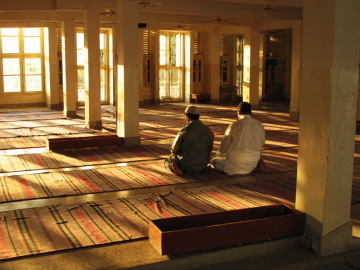 Pakistan has traditionally had foreign students come to study Islamic theology. But after 9/11, the Musharraf regime, allegedly under US pressure, sought to discourage madrassas as they have been hotbeds of radical Islamist teaching. A senior ICT administration official who did not want to be named said the government was “encouraging establishment of those madrassas which were ready to heed to its policy of enlightened moderation”. Under this policy, the managements of new seminaries have to fulfil all the requirements of the religious affairs ministry, prohibiting them from following practices that fan religious hatred and extremism. Interior Minister Aftab Ahmed Khan Sherpao has recently said extremism posed a greater challenge than terrorism for the government. The authorities concerned seem reluctant to take action against unauthorised seminaries, fearing the “usual strong reaction” from students. “Some 12,000 to 15,000 students are studying and residing in all madrassas in Islamabad, and if any action is taken against them, they may become violent and create law and order situation,” the official said. Thousands of seminaries were set up between 1996-2001 by the Jamiat-Ulema-e-Islam (JUI) leaded by Maulana Fazlur Rahman, leader of opposition in Pakistan’s National Assembly and secretary general of the rightwing political alliance Muttahida Majlis-e-Amal (MMA). These seminaries, mainly along the border with Afghanistan, are located in Balochistan, North West Frontier Province (NWFP) and tribal areas in Waziristan. They had trained thousands of fighters from among the young Afghan refugees who joined the Taliban forces. Western security experts and media reports have noted that despite Islamabad’s denials and government monitoring and controls, this process continues, angering the government of President Hamid Karzai now in charge in Kabul. There is also domestic fall-out in the form of protests by collective bodies running madrassas and the clergy. MMA has ridiculed Musharraf’s efforts at building a network of ‘moderate’ madrassahs. Rahman has repeatedly said that he was doing it “under American pressures”.